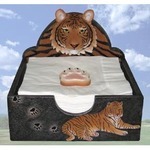 Tiger Gifts - Click on an item for more details! 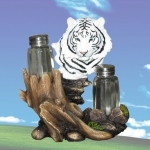 Bring elegance into your home or office with this Faux Wood Tiger Bust Statue. Representing the beauty of nature and handcrafted with the finest detail, the intricate process makes this an exceptional piece of artwork with lasting durability. A magnificent treasure to enjoy for a lifetime! Faux wood 11 inches tall. The Trio Playful Tigers Sculpture is beautifully exotic, featuring exquisite design. The detail and craftsmanship are unparalleled. You are sure to find this exclusive art piece as your treasure trove of unique gifts and decorative accents. Poly-resin, hand-painted 13.75 inches long. 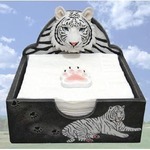 The detail and craftsmanship of this "Tigris" White Tiger Head Statue is unparalleled. You are sure to find this exclusive art piece as your treasure trove of unique gifts and decorative accents. The perfect combination of wildlife and art, to bring joy to every home. 16" tall. poly-resin with hand painted finish.